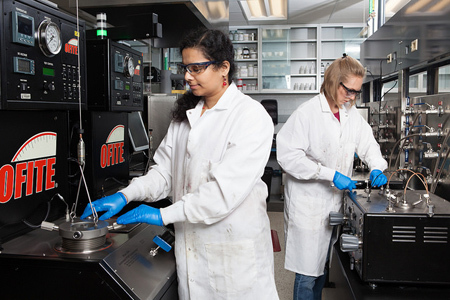 UT PGE professors develop interdisciplinary research in petroleum and geosystems engineering as well as other areas related to energy and the environment. The faculty conduct $13.7 million in research a year, more than any other U.S. petroleum engineering program. UT PGE faculty produce innovative research in 12 dedicated areas related to oil and gas led by our world-renowned faculty. Every summer, UT PGE hosts the Summer Undergraduate Research Internship (SURI), an undergraduate research program that gives leading students from across the country the opportunity to work with our highly-esteemed faculty. Together, students and faculty produce ground-breaking research encompassing a wide variety of hot energy topics. UT PGE graduate students produce influential theses and dissertations that help solve the oil and gas industry’s recovery and environmental challenges. This section features the most recent papers as well as our 10-year database.